This is one package pinout of AGQ21006,If you need more pinouts please download AGQ21006's pdf datasheet. AGQ21006 circuits will be updated soon..., now you can download the pdf datasheet to check the circuits! 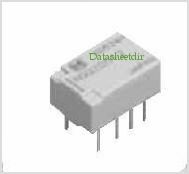 RDHA720SF06A1NK, Radiation Hardened 60V 20A Solid-State Relay In A Hermetic Package. Configured As A Single-pole-single-throw (SPST) Normally Open Relay.